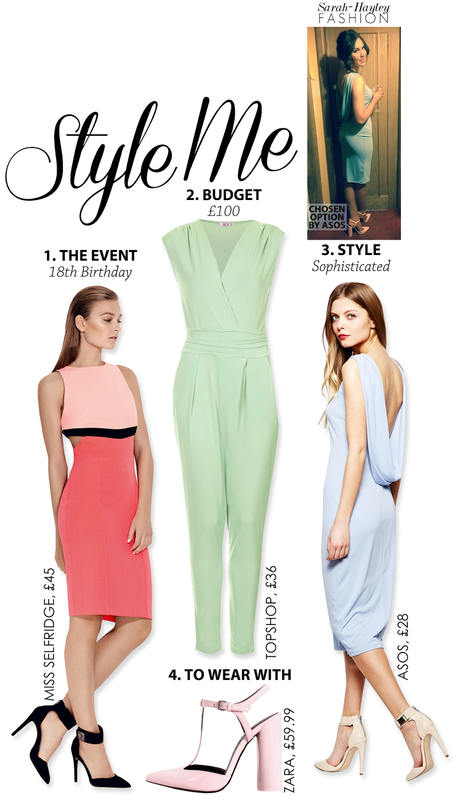 Introducing 'Style Me' - A New Monthly Post to Style You Personally. Owing to a conversation I had with a friend recently I decided to introduce an exciting new monthly post entitled, ‘Style Me’. This opportunity will allow you to be styled by me via email. Whether you have an upcoming ball or summer wedding to attend, or maybe you need some work style advice, whatever the occasion I will aim to find you the perfect look to solve your style problems. This months 'Style Me' is for Olivia who needed an outfit for her 18th Birthday. I am thrilled that Olivia chose my favourite choice, a periwinkle shift dress featuring a draped back and elegant slash neckline by ASOS. Would you like to be in the next 'Style Me' post? The service is completely free and there is no obligation to buy anything I send you. Simply email your name, age, and the answers to the following questions to: styling@sarahhayleyfreelance.com with STYLE ME in the subject box. 1. What event are you attending? 3. What style would you like to adopt? For example, edgy, trendy, colourful or sophisticated? 4. Have you bought anything already to wear with your new outfit?